I love crushed ice! Next best thing--cherry slushies. When I was pregnant with Jake, Dan gave me a Snow Cone Machine from baby Jake for my Mother's Day gift. Place ice in your snow cone machine or purchase a bag of crushed ice. Sonic has the best crushed ice, if you have one in your neighborhood. Next, place a small amount of ice in cup, add syrup, repeat until you get to the top finishing with syrup. ps......Walmart and Target have cherry syrup. I found one of our favorites at Zurchers in a huge economy size. Have Fun! I wasn't sure what to expect when I tried this recipe. Dan loves Marshmallow, me.....not so much. I have to tell you, I think I ate more of these than Dan did! I found the recipe in my Toll House Recipe book. Enjoy! Preheat oven 375 degrees. Spray 9 x 13 pan with cooking spray. Microwave 1 cup chocolate chips in microwave safe bowl for 1 minute; stir. Microwave an additional 10 to 20 seconds until chips are melted. Set aside and cool to room temperature. Beat sugar, butter and vanilla until smooth. Add eggs in one at a time until well combined. Add melted chocolate chips. Stir until well combined. Gradually add flour mixture, mixing until well combined. Spread batter into prepared pan. Bake 16 minute or until toothpick come out slightly sticky. 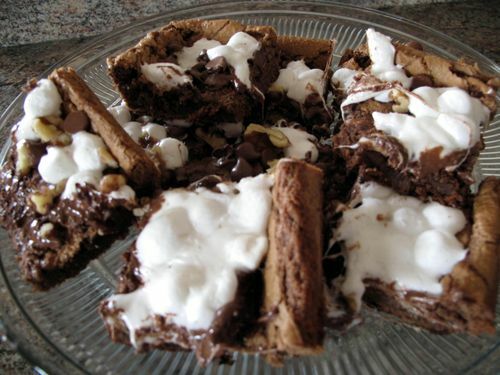 Remove from oven and immediately sprinkle marshmallows, 1 cup chocolate chips and nuts. Return to oven an additional 2 minutes or just until marshmallows begin to melt. Cool on wire rack. Cut in squares and serve warm.